In which we view the rather wooded (understatement!) last resting place of some Backler/Abelin ancestors, and reflect on how moving it is to be there, despite the absence of any visible marker. I see from my photographs that it was way back in 2010 that I ventured to north London to visit Highgate Cemetery. New online records had shown this to be the last resting place for Samuel Backler and his wife Mary [nee Pellatt]. 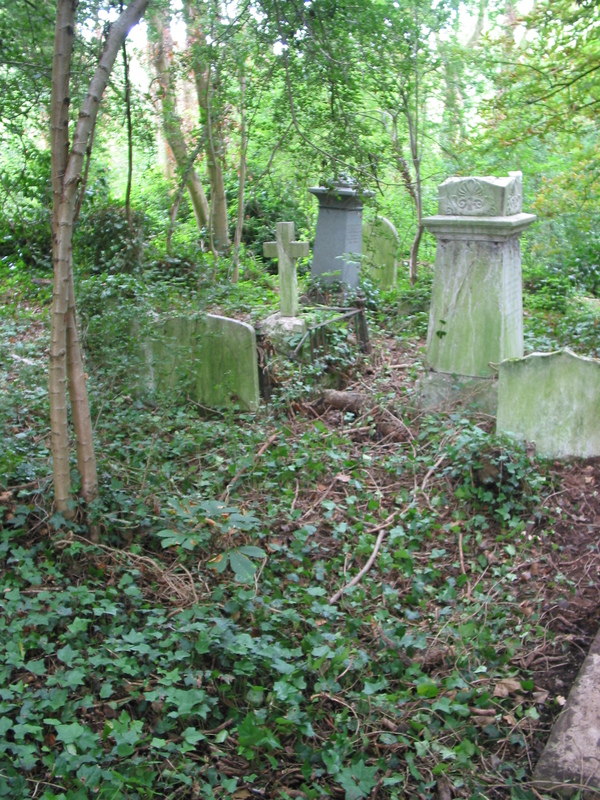 What was once a major privately-owned cemetery, run by the London Cemetery Company, is now under the care of the charitable Friends of Highgate Cemetery, a similar arrangement to those of the other great municipal cemeteries such as Nunhead in south London, where other Backlers are interred. Nowadays the focus of the Friends is not only on burials, which continue to take place in quite small numbers, but also on conservation of both its memorials and of nature in line with its overall purpose to ‘promote the public benefit’. On writing to the Friends, I received a letter revealing that more folk than Samuel (1870) and Mary (1857) shared the gravesite: their daughter Susannah (1883) (whose marriages to James Boulding and Edwin Cross will feature in future posts); Esther Maria (1918) (wife of Magnus Christian Abelin); and their daughter-in-law Edith Ann (nee Foster) Abelin (1928). I had high hopes as I arrived at the Cemetery for my appointment to be escorted to the gravesite. Immediately, however, I was warned by my guide that there was nothing to see. Up the hill we marched, past the famous sites of the Egyptian Avenue and the Terrace Catacombs, curving around to the right along a roughly paved path. My guide had searched out the area previously, so knew when to turn right off the path, into a treacherous wooded and overgrown section, with monuments in different states of repair, and unstable ground. We reached a spot where he had laid out sticks to mark the spot – and that was it! I was very moved, albeit a bit disappointed. Despite the presence of monuments nearby, my guide had explored the area, probing with his stick, and had not found a memorial at our site. There was surely once one there, but no longer. This was an area in the early West Cemetery on high ground, which at the time of the earliest Backler burials would have had a view over London. It was a fashionable and beautiful site, allowed to become run down during the 20th century. A very special place: Highgate Cemetery is a Grade 1 listed site, and is a very special place not only for those whose ancestors and more recent relatives are interred there, but also for anyone interested in its historical importance for London. 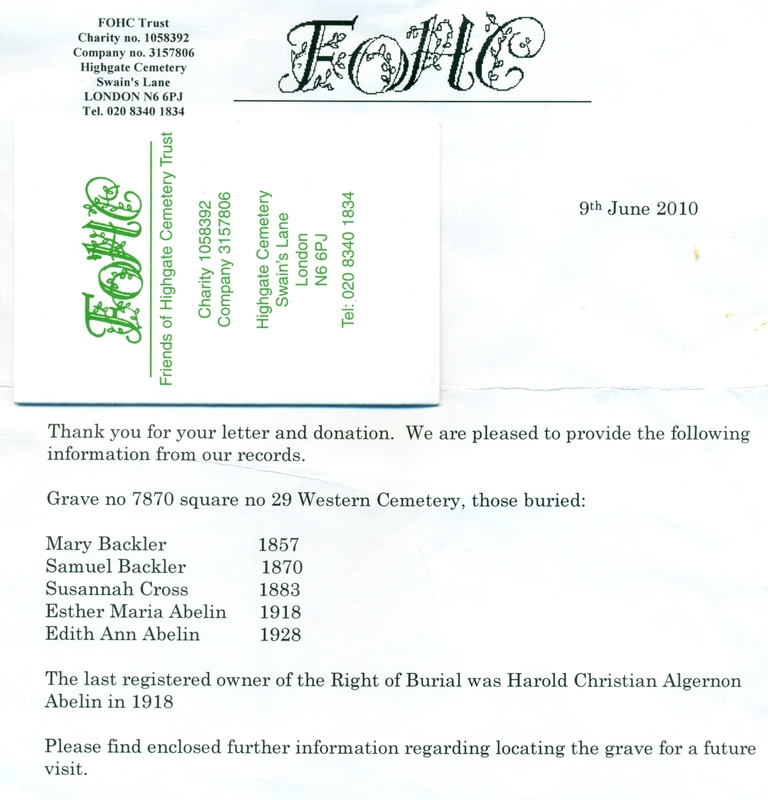 I feel privileged to have ancestors for whom it was their last resting place, and have become a life member of the Friends in order to support their ongoing work. I am sorry I now live so far away!